Glinting in the sunlight of 2019’s dawn, Lost Crowns could be a new national musical treasure waiting to be unearthed. 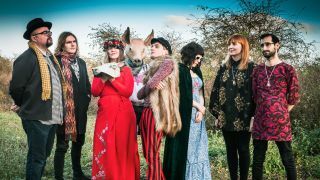 Conjuring images of the headwear of figures such as Richard III whose crown toppled into a bush at the Battle Of Bosworth Field, it’s a very English kind of out-there psychedelic pop, ruled by Plymouth-born but London-based chiselled-cheeked guitarist Richard Larcombe. After 20 years in folk/art rock duo Stars In Battledress with his brother James, Richard’s universe expanded. The Incredible String Band are also an influence (“I heard them in my teens and thought, ‘Right, a song can be anything.’”), as well as the mighty Cardiacs. “There’s a band of wonderful unpredictability, teeming with details, vying for your attention. “That’s what I want to do with Lost Crowns,” he explains, “It’s musical cross-hatching, reflecting how complicated and difficult life can be, but is also offering an escape from it. “I want us, and the listeners, to leave the Earth,” he says. “It’s our tagline, ‘The head will leave the body.” That’s what I say before we go onstage: ‘I don’t mind a few bum notes but the head must leave the body.’” ‘Losing your crown’, indeed.